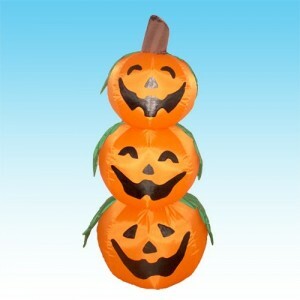 Halloween inflatable decorations can instantly add the spirit of the holiday to your home or yard. These fun decorations can be used alone or as part of a larger display. They can be used on the patio, porch, indoors, in a store window, or as a sidewalk or yard display. BZB Goods manufactures a variety of seasonal decorations, including inflatable yard decorations for all the major holidays. Two of the inflatable decorations in this review are manufactured by BZB goods. The 4 Foot Halloween Inflatable 3 Jack-o-Lantern Yard Art Decoration has several features that will make this a great decoration for either indoor or outdoor use. This is a cute inflatable Halloween decoration, and the fact that the bottom is weighted to keep the decoration standing upright, makes it easy to use as an indoor decoration as well as an outdoor decoration. Reviews for the 4 foot Halloween inflatable 3 Jack-O-lantern yard art decoration are very good. Customers like this inflatable and have few complaints with it, although some customers do feel that the light to illuminate these pumpkins is somewhat dim. Imagine the heart stopping experience your neighbors will get when they come walking up to your home on Halloween to be greeted by this artistic rendition of a huge Australian redback spider! This huge spider is sure to earn you a few gasps for Halloween. Think how scary this would be for an outside haunted trail. Spread a giant spider web between two trees and on the ground and tether this spider next to it. The illumination will help to bring this spider to life and create an eerie glow! There doesn’t seem to be any reviews available for this spider at present. However, other BZB Goods inflatables do get good to excellent ratings. This >8 Foot Tall Inflatable Dead Tree With Ghost On Top/Pumpkin On Bottom has all the right features to make this dead tree stand out among your outside Halloween decorations. This 8 foot tall inflatable dead tree with ghost on top/pumpkin on bottom is really cute and a little bit scary. This will make a great decoration, either standing alone or combined with other decorations. There are several reviews scattered about the internet for the 8 foot tall inflatable dead tree with ghost on top and pumpkins on the bottom. These reviews are extremely good with most customers really liking this inflatable decoration. Some customers did feel that the cord for this inflatable is quite short and would have preferred it to be longer. But overall, customers were really pleased with this inflatable dead tree with ghost and pumpkins.